Provisioning is one of the Crafts in the amazing game, Elder Scrolls Online (ESO). ‘Provisioning’ in ESO is ‘Cooking’. Do not let anybody tell you cooking/provisioning in ESO is not important, (because besides being fun), cooking lets you easily make foods from recipes you find; that give you ‘Buffs’ as good as spells or potions, and sometimes even better ones. Hireling: This lets you have a Hireling who will gather food and drink ingredients for you while you’re offline! The Hireling skill can be used once per day. How cool is that? – I want it! Whenever you see a cooking pot over a fire, just click on it and it brings up your ESO Provisioning Menu (Cooking Menu) from your Crafts Interface Menu. This cooking menu is so well organized that it really makes cooking fun! On left top of your interface menu it will say Provisioning with your level at it in front of it, and it has a progress bar underneath. This is fun because as you cook, you see your progress bar going up for every food or beverage item that you make! On the right top of your cooking menu, you will see the word COOK and a picture of a piece of food and a beverage for which kind you will make. It also has check boxes for: ‘Have Ingredients’ and ‘Have Skills’. You can filter what you want to show up that way. For example, if you check both boxes it will show you what you can make by the ingredients you have and the skills you have based on the recipes you have learned. If you have not found or learned any recipes yet and you try to cook, a message will come up saying; ‘No recipes found that match your filters’, even if you have the ingredients. On the other hand, if you learned a recipe, but do not have enough of the right ingredients to make it, it will quickly tell you that too. If you do have a recipe learned that you have the ingredients for, it brings that all up for you without you having to hunt through your inventory for them one by one by name. What you have that you need is pulled up for you and you can make whatever you have the ingredients and skills for, having learned that recipe. If you have learned a recipe and have the ingredients for it, it will also bring up an option message for you, to suggest you may push the R button on your keyboard to craft it (see Figure 2). However, Provisioning (Cooking) differs from alchemy, because you must have Provisioning Recipes to be able to cook something, even if you have the ingredients. You cannot just eat raw cooking ingredients to learn recipes. So when you come across recipes in your adventures, do not underestimate their value to you, and grab up all the recipes you can find. For example, on one play through as a Wood-Elf (Bosmer), I found a recipe before even getting out of Cold Harbor; I collected some food ingredients here and there too, and was able to cook up something from learning that recipe right away. Where can you find recipes like my Wood-Elf did? – They can be found in almost anything that can be opened, such as crates, pots, chests, trunks, crates, dressers or any other kinds of containers – or can be found on monsters or enemies etc. On another play through I tried some other races of characters, a High Elf (Altmer), then next a Khajiit, and by chance I did not find any recipes yet before leaving Cold Harbor and first trying to cook with each of them. 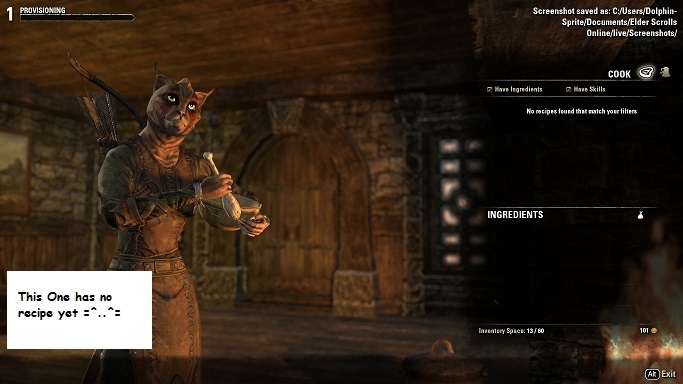 So, when I tried with my Khajiit to cook something with those same ingredients that I used with my Wood Elf – I could not – because those other particular player-characters such as my Khajiit pictured below, had not found and learned that recipe yet. My adorable Khajiit in the Figure 1 below had no recipe yet. This was the first time I realized how important recipes are. It is not enough to just mix-up ingredients because you know in your own head what they can make; your player-character must have found and learned that recipe to be able to make that food item. 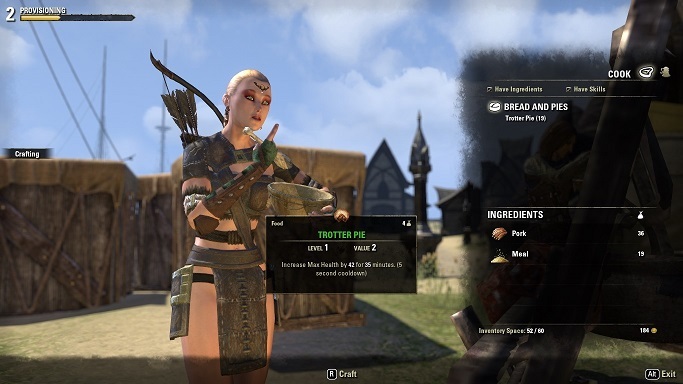 So then when I next made a Nord player-character, I kept my eye out for any recipes I could find and found a level 1 recipe for Trotter Pie. Soon I had both the ingredients, ‘pork’ and ‘meal’ for it, and was easily able to make Trotter Pie. I made several Trotter Pies and not only raised my provisioning progress up for each Trotter Pie I made till I went up some levels, but each Trotter Pie is as good as a potion you could make in alchemy, except it is food you can eat. For example, Trotter Pie has the effect of increasing your Max Health by 42 for a full 35 minutes just for eating one of them, but it only has a 5 second cool down before you can eat another one! Different Foods and Beverages that you can make have varying effects; but they are all quite helpful and some could make a difference in a pinch, between winning and losing a battle. I know my brand-new Nord would have been had for toast, if she had not lucked out in finding a recipe early on, and made and drank a brew that buffed her up; just before being out-numbered in a surprise attack! See Figure 2 below, of my lovely Nord Lass, happily licking her finger, as she is cooking up some yummy Trotter Pie, which will boost her Max Health. The animations of them cooking are quite fun too! Remember friends, you just can’t lose by grabbing all the recipes you can find. Here are some more reasons why it is really cool to collect recipes to learn or sell. When you find a recipe and add it to your inventory it will glow a particular color, (green, blue, etc. ), before you learn it. The colors of the recipes represent their quality and the rarity of the recipes you find, with recipes whose titles are green glowing recipes in your inventory, being some of the ones you may commonly come across at first, that you may also first find ingredients for early in your game. Once a recipe is in your inventory, you then click on the glowing colored title of the recipe with your mouse curser, and the recipe will be consumed as it is learned, and so permanently added to your cooking menu. When you learn that recipe you have it for permanent use of it with that player-character, but it no longer takes up space in your inventory. Once you have learned a recipe of a particular type it does use it up so that one cannot be sold, but if you have other recipes of that same exact type it will not let you waste them by re-learning them and you can sell the duplicate ones! So since it is easy to tell when you have already learned that same recipe without hunting and pecking, you can quickly and easily discern which recipes in your inventory are safe to sell. Recipes fetch a pretty decent price with vendors. Yes, you can never find too many recipes – they are valuable for cooking – and can also be sold for a good price – if you already found and consumed one like it for your menu book. The exceptions to permanent recipes are one-use recipes! But wait! -- Do not be disappointed by finding a one-use recipe, because these are particularly valuable! A one use recipe may not have common duplicates around for you to sell or be reusable again in your menu, but one-use recipes are worth much more than their weight in gold – because they let you make yourself AWESOME stuff. A one-use-recipe you find may allow you to make yourself something you merely have to then eat or drink to get a permanent health, magicka or stamina buff – or some other super long-lasting buff to your player-character. Now that you have perused this Provisioning Guide for cooking in Tamriel, for the Elder Scrolls Online, you should have the basics of cooking well established in your mind. We hope to see you around the fireside! One use recipes sound a bit weird to me, it's like if I learned it then I know it so I wouldn't need the recipe again, but apart from that, this whole cooking thing's just awesome I think! Hi Drew! Thank you for your kind words. Yes, when U learn the recipe it is consumed but becomes automatic in your cooking menu afterwards, so that your ingredients and recipe skill are all there for you to automatically reference and use when you need them and have the ingredients :) That's part of what is so cool about it. Then U can sell the extra recipes, that are like the ones you already learned! :) Have fun!